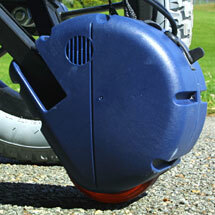 Sinclair's Wheelchair Drive Unit (right) is an ingenious extension of the principles used for the Zeta bicycle motor. Although self-propelled wheelchairs are increasingly common these days, they tend to be heavy and expensive pieces of equipment. 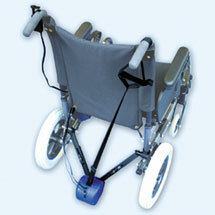 The WDU provides an inexpensive way of retrofitting old-style wheelchairs with a power assist. The way it works is so simple that it's remarkable that nobody seems to have come up with it before. A motor unit is positioned at the end of an arm (or perhaps a leg?) at the back of the wheelchair. This drives a wheel which is held in contact with the ground, and is powered by a small battery pack attached to the frame of the wheelchair. The motor is activated by the person pushing the wheelchair, using a control which is attached to one of the chair's rear handles. The device as a whole is an impressive piece of miniaturisation, weighing less than 10lbs (4.5kg). It should be noted that the WDU is not designed to be controlled by the wheelchair's occupant, nor is it designed to propel a wheelchair for long distances; it is strictly an assistive device for situations where a little extra motive power is required, such as going up slopes. Sinclair claims that WDU can supply "100% of the power needed to climb a one-in-eight hill at a steady 1.7 mph or 50% of the requirement for a one-in-four ramp (both assuming a 13 stone [82.7kg] patient)." The rechargable battery lasts for about 60 minutes, providing a top speed of 2.1 mph (3.4 kph). Like the SeaScooter, the WDU is a joint venture between Sinclair Research and Daka Development Ltd. Sinclair did the design work, while Daka is responsible for the product's manufacture, marketing and distribution.